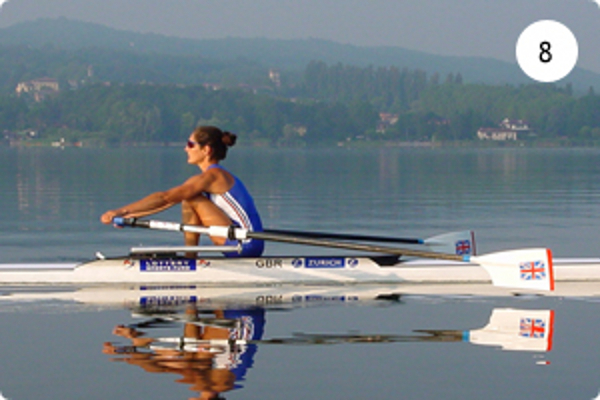 Rowing is a water-based endurance sport - considered one of the most technical and toughest sports in the world. River/inland rowing involves sitting on a movable seat and using the legs, back and arms to move the boat with the oars. People row in crews or on their own. Sweep rowing - one oar per person. Sculling - two oars per person. Bow-side refers to the side of the boat where the oar is out to the left of the rower (the boat's starboard side). 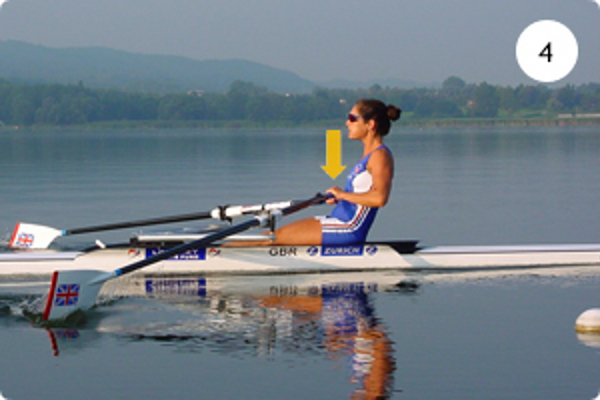 Stroke-side refers to the side of the boat where the oar is out the right of the rower (the boat's port side). During the racing season the Coláiste Iognáid Rowing Club competes in a range of events around the country. For details of domestic races of interest for Coláiste Iognáid Rowing Club in the upcoming year, see Schedule and Regattas. Rowing is broken into two seasons - head of river races and regattas. 'Heads' are long distance races usually ranging from 3km (~1.5 miles) up to 10km (7 miles) against the clock. Crews are timed from start to finish and depart the starting area at timed intervals. Head season is from October until early April and complements winter training - long distance. Regattas are shorter races (500m to 2km) against other crews (2 to 6). Regatta Season prepares crews for the Championship distance (2km) and runs from early April until July. The National Championships are the main focus of the season. The "Champs", which Coláiste Iognáid competes in each year, are held at the Irish National Rowing Centre on Innishcarra Lake in County Cork. This usually is scheduled for mid-July and all crews will participate in this event. 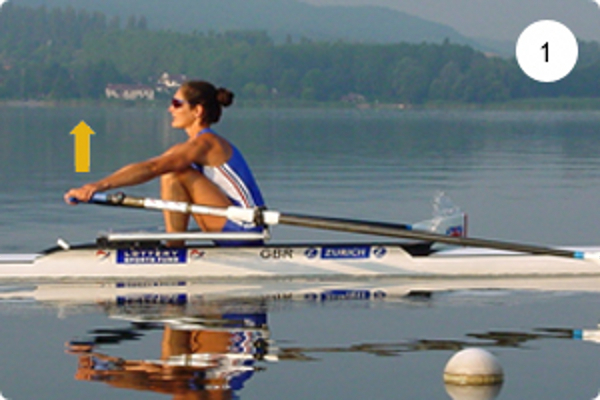 Rowing training is broken down into land-based and water-based training. Ergometer (a rowing machine that monitors the rower's performance - often referred to as an erg). Circuit training, resistance training, running, swimming, etc. During the season, rowing is every Saturday and Sunday for everyone - rowing on other days will vary, depending on crew. Land training is often indoors, so shorts, t-shirt and a good pair of runners are sufficient. Water-based training takes place outdoors!! During cold weather the best advice is to wear a lot of thin layers (thermals, fleece etc) which can be removed as the rower gets warmer. Ideally, gear should be close fitting (so the oars don't catch in it) but allow plenty of joint movement and not have any zips, pockets, etc. that can get in the way of oar movement. No jeans, woolly jumpers or any type of clothes that prohibit movement. There are specific rowing gear manufacturers who design gear suitable for rowing - these include one-pieces, wet-tops, zephyrs, gillets etc. The club colours for Coláiste Iognáid Rowing Club are maroon, black and white. The racing gear is specially made for the club and is usually ordered once a year. All crews from 2nd year up will wear this racing gear. 1st years generally wear white shorts and black shorts. The Irish Amateur Rowing Union (IARU) requires all competitors to wear club colours when racing. Athletes should eat within 30 minutes of finishing exercise to help recovery (e.g. carbs/sugars [pasta/fruit] and protein). They should not eat during the hour before training. The importance of hydration and keeping hydrated cannot be over-emphasised. Rowers should always have a bottle of water/sports drink (can be home-made) with them up the river. Rowers should drink up to 1 litre of water in the 90 minutes before they train, bring 500mls of water during training, and drink at least 500mls of water after training to aid recovery. And they need to drink more water throughout the day. 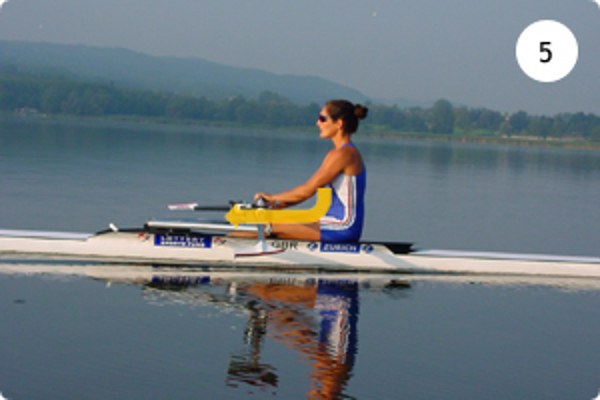 The total amount a rower should drink, per day, depends on their weight. Use the below calculator to find out how much water you need. Litres on a rest day. Litres if you have 1 training session. Litres if you train twice in one day. See our links page for extra information on Rowing gear, Nutrition, and Hydration. Founded in 1934, it has seen hundreds and hundreds of rowers pass through its boat shed! It currently has about 70 members - one of the largest rowing clubs in Ireland (Junior or Senior). There are approx. 12 - 15 coaches. The head coach is Dave Mannion. The club won approx 25 events at Regattas throughout the country in 2015. The highlight was probably a victory at the National Championships in the Junior 16 Mens Eights. In 2016, the Jes won both the J15 and J16 Womens Eights at the National Championships. And one of our senior girls, Caoileann Nic Dhonncha, qualified for the Irish team, representing her country in the Holmes regatta in Cardiff. Former members of the club have gone on to successfully represent Ireland or their club at the Beijing Olympics (Cormac Folan) World Senior Championships,(Cormac Folan, Niall Kenny, Liam Molloy) World U23 Championships, World University Games, Home Internationals, Henley Royal Regatta, Women's Henley and National Senior Championships. Niall Kenny won a silver medal in 2010 in the Under 23 World Championships and also rowed in the World Championships in 2012. Aifric Keogh rowed in the 2015 and 2017 World Championships. No person may travel in the coaching launch or cox a crew without wearing a lifejacket. 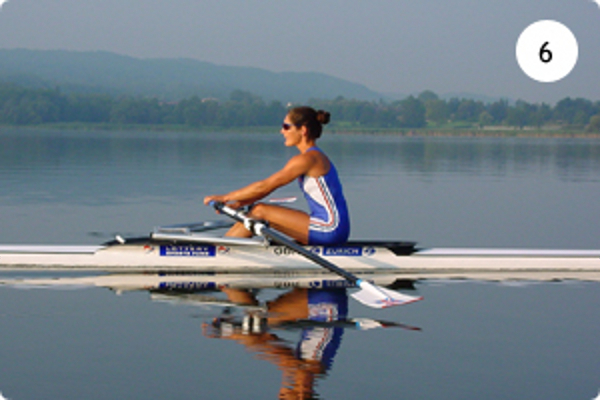 No rower is permitted to go onto the water unless accompanied by a coaching launch. Your sons and daughters above first year will travel in a mixture of the the school bus and parents' cars. First-years travel with parents, again on a roster system. On the ergometer (rowing machine), the importance of the legs can drop by up to 2%, with the arms increasing by the same amount. The following photos and notes are an edited extract from the British Rowing web site (britishrowing.com). This is the start of the drive phase of the stroke, when the blades are placed in the water (called 'the catch') and the boat is driven forward using the large muscle groups in the legs and body. The shins are vertical, the back straight and leaning forward and the body closed up on the thighs. All that is needed is for the hands to lift a little more in the direction of the arrow, and the blades will be fully 'locked' in the water. The seat begins to move backwards faster than the shoulders. This fault is known as 'bum shoving' and it causes the powerful leg drive to be weakened considerably. It is a mistake to think that rowing is pulling with the arms, but many beginners do this. The legs should be doing most of the work here, with the arms relaxed and the back still straight and leaning forward. The hands follow the path of the arrow parallel to the boat. The feeling should be that of hanging off the blade handles. Arms are pulling over the knees into an arc causing the blades to plunge too deep. The blade handle is pulled down (instead of along) causing the blade to lift from the water before the end of the stroke. This is called 'washing out'. The hands make a small tap downwards, to lift the blades clear of the water. The legs are flat down. The back is straight, but leaning slightly back so that the abdominal muscles feel a slight pull. The blade handles just brush the body when the spoon end is flat on the water. This is the end of the drive phase. 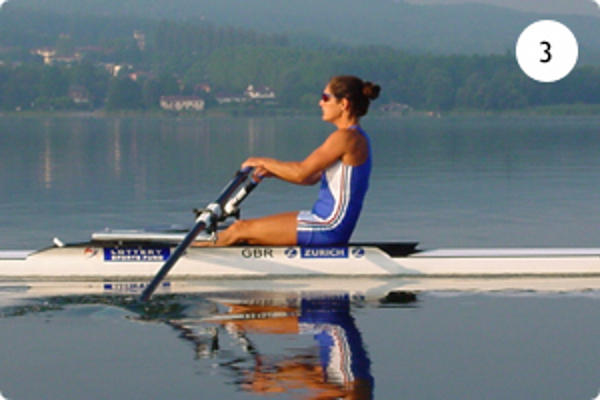 The rower sits too upright and the elbows droop down - the effect is to shorten the stroke. 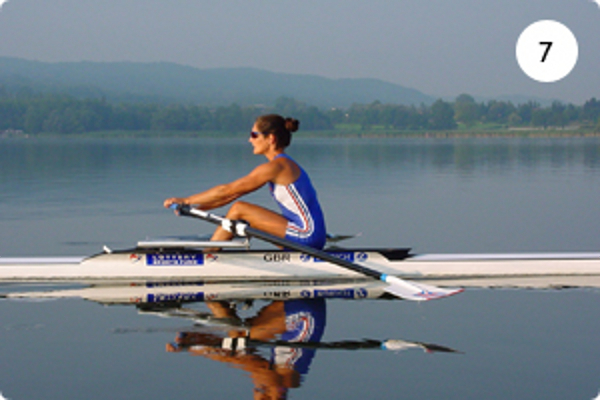 The rower leans too far back - which delays the recovery. At the beginning of the recovery phase, the hands move down and away, following the trajectory of the arrow. The arms move away from the body, which is balanced vertically, but the seat has not yet begun to move and the knees are still held down. The arms, shoulders and neck are relaxed. This posture aids recovery from the exertion of the stroke, and helps to keep the boat balanced in the water. The hands are higher or lower than the point shown. The body is not leaning forward at the angle shown. The rower does not slow momentum before taking the catch. 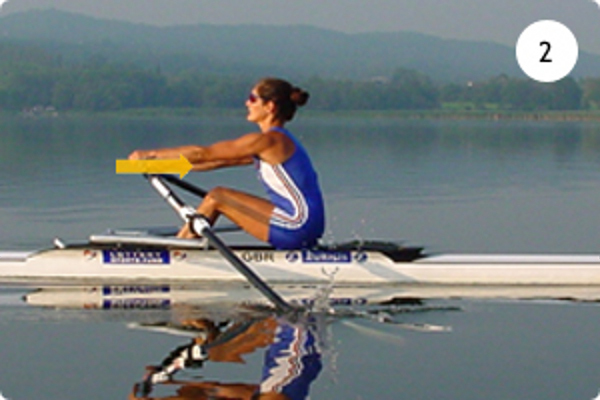 The rower does not reach forward to get a long stroke. The body collapses over the knees. The shins are not vertical. To achieve the technique illustrated in these photos requires many hours of hard work and concentration.